Toxic Waste In Cigarettes – Are We Angry Yet? Can you believe that RJR tried to get a tax credit for disposing of tobacco waste by processing it into cigarettes instead of dumping it in the landfill? Check it out – links to the original court case are below. As this post is written the tobacco fields of Virginia and the Carolinas are flooded and destroyed. There are millions of pounds of waterlogged tobacco lying in mud mixed with sewage and dead pigs,the whole mess waiting to be plowed under or hauled away. Or not. It turns out that cigarette giant RJR has a series of secret processes for making all kinds of tobacco waste into cigarettes. The tobacco farmers may be 100% wiped out, but I’ll bet RJR already has crews out there gathering up those dead stalks while they’re firing up the equipment to run that crap through their secret “G-Series” processes. More on that shortly. But … if a few months from now that second-hand cigarette smoke drifting around on the streets suddenly starts smelling faintly like rancid pigshit with maybe a hint of faux mint you’ll know why. Here’s the background on the secret G-Series processes that RJR doesn’t voluntarily reveal to anyone. Picture a North Carolina courtroom in 1998. The great, all-powerful RJ Reynolds has just filed an appeal against a ruling by the North Carolina Department of Environment & Natural Resources. And lost. The ruling says sorry, RJR can’t classify the tobacco stems, scraps, dust and trash that it uses to manufacture its cigarette products as solid waste. Now, doesn’t that bring up the question – why would RJR want to classify its manufacturing materials as solid waste? It sounds like a sneaky little tax loophole but hey, if RJR wants to get a tax credit for disposing of their waste in an environmentally sound fashion, what’s the problem? The problem is that RJ Reynolds claims it is “disposing of” this waste by manufacturing it into cigarettes, and says that qualifies it for tax breaks because the waste isn’t going into landfills. It’s being bought and smoked by their customers. There are some really clever folks down North Carolina way. Here’s a quick look at some of the code-named RJR projects to develop processes for turning trash into cigarettes. G__-nnL = base for item id. G7, G16, and G17 series codes refer to reconstituted tobacco processes while G13, G14 and G18 refer to expanded tobacco processes. G15 series refers to pectin release cast sheets. G7-A Ammoniated tobacco sheet developed in response to Marlboro (RJR, 1991b). G7AE Ammonia applied to the G7 extract prior to making the reconstituted sheet (Gignac et al, 1988). G7-DAP Evaluate DAP for improving the taste of G7A (RJR, 1989b). The basic idea is that since RJ Reynolds is disposing of millions of pounds of waste every year by making it into cigarettes and selling them to American smokers rather than dumping all that waste in a landfill, the company therefore deserves a tax break for being good environmental stewards. The testimony of RJR and others recorded in this lawsuit reveals information about how RJ Reynolds manufactures its products that ought to give any cigarette smoker, and any regulator, and any jury, cause to realize the extent of the knowingly deceptive and harmful practices of this cigarette giant. If you think those ideas are your own, think again. They are implanted. But really consider the evidence, so cleverly hidden in plain sight, and it becomes compelling and conclusive even in partial outline. Sooner or later the cigarette industry is going to have to answer for this hidden but discernible criminal conspiracy against humanity, which is of a magnitude and horror that makes it virtually incomprehensible even to thoughtful minds. And that, of course, is exactly the idea. In manufacturing tobacco products, Reynolds does buy tobacco leaves at auction. 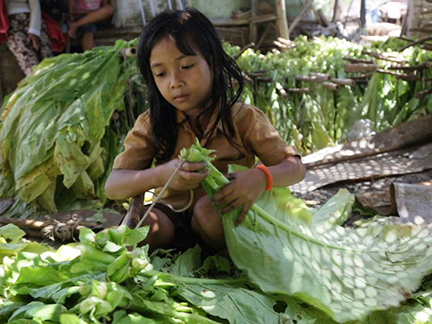 The tobacco is sent to a stemmery, where the stems (hard, woody part of the leaf) are separated from the lamina portion of the leaf (material in between the stems). The separation process also generates small scraps of tobacco (scraps) and very fine scraps of tobacco (dust). The usable tobacco lamina material is sent to the manufacturing operation where it is blended and becomes part of what winds up as a cigarette. The stems, scraps and dust are packed into containers and sent to a storage facility until they are either processed into reconstituted sheet tobacco, through related treatments known as the G-Series processes, or are discarded. The reconstituted sheet tobacco is shredded and blended with the processed lamina strips and made into filler for cigarettes. The reconstituted tobacco filler is part of most brands of cigarettes made by Reynolds, and enables cigarettes to be made with lower tar and nicotine content which according to Reynolds has been “demanded by smoking consumers”. Reynolds uses approximately seventy million pounds of tobacco stems, scrap and dust each year in making reconstituted sheet tobacco for its own use, and many millions more for other manufacturers. Reynolds also disposes of between five and seven million pounds of tobacco waste materials in landfills each year. This material is of a lower quality than the stems, scrap and dust used in the G-Series processes; much of it is generated by the manufacturing process, rather than the stemmery, though some tobacco waste generated by the stemmery is also disposed of. In order to keep up with its production requirements for reconstituted tobacco, Reynolds imports tobacco stems purchased overseas. For example, in 2006 (the latest year for which US Government data is available), the US imported 136.8 Million pounds of Tobacco stems. In other words, there weren’t nearly enough stems being produced from US tobacco for the manufacturers to use in making their products. These manufacturers, on the other hand, would probably say “Well, Tobacco stems are still real Tobacco, so what’s the big deal?” The big deal of course is that many of the most dangerous pesticides used on tobacco overseas (like slug and snail control chemicals) are taken up from soil application into the roots and stems, and others translocate from the leaf where they are sprayed into the stems and stalks. While it’s bad enough that this corporation wants tax breaks for selling waste to its customers, what isn’t revealed here is that this “tobacco” waste is highly contaminated with toxic, carcinogenic, mutagenic and endocrine-disrupting agricultural chemicals and pesticides. That single sentence “In order to keep up with its production requirements for reconstituted tobacco, Reynolds imports tobacco stems purchased overseas” holds the clue. When you look at where RJ Reynolds buys its tons of waste overseas you find that it is coming from countries that have absolutely no regulations on pesticide and other toxic chemical use on tobacco crops. This means that the waste that RJ Reynolds is putting in its cigarettes, and that Reynolds is selling to other cigarette manufacturers as reconstituted “sheet” contains high levels of pesticides that are totally banned for use on any crop in the US. Many of these chemicals are known carcinogens, they are known to destroy nervous systems, they are known to produce deformed babies, and they are known to produce a range of debilitating and fatal diseases in humans. Furthermore, carefully-done research studies show that many of these pesticides, especially the more recent chemicals that attack DNA and other genetic materials in insects, are far more dangerous to children, young women, and the unborn in every population, and to people with Latin, Native American, Asian or African biological ancestry, than they are to adult Caucasian males. That explains why pesticide residues in cigarettes “aren’t a problem” for the white guys running the so-called “tobacco” industry. RJ Reynolds and all the others could choose to manufacture their cigarette brands from pure tobacco leaf grown in the US or even other countries under strict pesticide regulations. The reason they choose to pack their products with toxic waste instead is because it is so profitable to do so, and because nobody has called any of them on the practice. As it happened, not so fast smart guys. The North Carolina judge actually ruled that time even the mighty RJR legal department had gone too far. The judge said no, the Dept. of Environment & Natural Resources is right, and you can’t claim a tax credit for disposing of your toxic waste by getting your customers to smoke it. Boo Hoo. RJR lost that one – or did they? They didn’t get a tax credit for making people smoke their waste instead of polluting the landfill with it, but I’m betting that what the engineer says in the court testimony remains true – “it’s so profitable that even if they don’t get a tax break they’ll still use G-7”. I can’t tell whether or not RJR is still using any of its patented “G-Series” processes in 2018 for disposing of toxic waste by making it into cigarettes and telling smokers they’re getting “true tobacco taste” or “natural tobacco”, or something equally deceptive. However, RJR is the biggest supplier of tobacco “sheet” to other manufacturers, and appears to be the biggest importer of tobacco waste for that purpose, so my guess is that the “G-Series” is not only alive and well (unlike smokers) but flourishing (also unlike smokers). So just to see what’s happening these days I’ve just filed a FOIA request for the USDA records that cover the $2 Billion worth of tobacco stems and trash imported in 2017. These records will show every US company that imported this toxic waste, the waste’s country of origin, and the importer’s certification for each shipment that it isn’t contaminated with residues of any banned pesticide like dioxin or DDT. Update (10/30/18) – no need to file a FOIA request – all the data on tobacco waste imports by American ‘tobacco’ companies that make that waste into cigarettes is right here. It turns out that RJR is NOT the biggest importer of tobacco waste for cigarette manufacturing – that honor goes to Philip Morris as you can see if you click here. Now if you would like to see a short video by Philip Morris that explains how they turn waste into cigarettes, click here. Just keep in mind that they slip the Big Lie in at about 2:11 into the video. That’s all they have to do to import those millions of pounds of toxic waste they’re going to make into cigarettes. They just sign and go, and nobody ever checks again. That may change. A little donation would go a long way toward supporting my efforts here. I’ll share the results of this FOIA inquiry in another blog post. Tags: aldicarb, aldrin, anti-tobacco, big tobacco, DDVP, dichlorvos, dieldrin, edndrin, endosulfan, low nicotine, natural tobacco, neurotoxins, organic tobacco, organochlorine, organophosphate, organophosphorous, PAH, sacred tobacco, sheet tobacco, Tobacco, tobacco additives, tobacco carcinogens, tobacco pesticides, tobacco toxins, toxaphene, toxic waste | Permalink.